IMO had maintained the Aviation Colour Code for Askja at Yellow since 28 August due to elevated seismicity and localized deformation. On 11 September the Colour Code was reduced to Green when seismicity had diminished significantly. The Global Volcanism Program has no Bulletin Reports available for Askja. Askja is a large basaltic central volcano that forms the Dyngjufjöll massif. It is truncated by three overlapping calderas, the largest of which is 8 km wide and may have been produced primarily from subglacial ring-fracture eruptions rather than by subsidence. A major rhyolitic explosive eruption from Dyngjufjöll about 10,000 years ago was in part associated with the formation of Askja caldera. Many postglacial eruptions also occurred along the ring-fracture. A major explosive eruption on the SE caldera margin in 1875 was one of Iceland's largest during historical time. 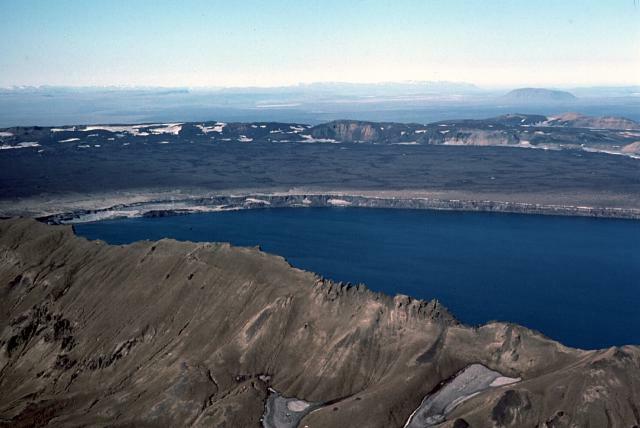 It resulted in the formation of a smaller 4.5-km-wide caldera, now filled by Öskjuvatn lake, that truncates the rim of the larger central caldera. The 100-km-long Askja fissure swarm, which includes the Sveinagja graben, is also related to the Askja volcanic system, as are several small shield volcanoes such as Kollatadyngja. Twentieth-century eruptions have produced lava flows from vents located mostly near Öskjuvatn lake. Carey R J, Houghton B F, Thordarson T, 2008. Contrasting styles of welding observed in the proximal Askja 1875 eruption deposits I: Regional welding. J. Volcanol. Geotherm. Res., 171: 1-19.
de Zeeuw-van Dalfsen E, Rymer H, Sigmundsson F, Sturkell E, 2005. Net gravity decrease at Askja volcano, Iceland: constrainsts on processes responsible for continuous caldera deflation, 1988-2003. J. Volcanol. Geotherm. Res., 139: 227-239. Sigvaldason G E, 1979. Rifting, magmatic activity, and interaction between acid and basic liquids. Nordic Volc Inst Univ Iceland, no 7903, 43p. Sigvaldason G E, 2002. Volcanic and tectonic processes coinciding with glaciation and crustral rebound: an early Holocene rhyolitic eruption in the Dyngjufjoll volcanic centre and the formation of the Askja caldera, Iceland. Bull Volcanol, 64: 192-205. Sigvaldason G E, 1992. Recent hydrothermal explosion craters in an old hyaloclastite flow, central Iceland. J. Volcanol. Geotherm. Res., 54: 53-63. Sigvaldason G E, Annertz K, Nilsson M, 1992. Effect of glacier loading/deloading on volcanism: postglacial volcanic production rate of the Dyngjufjoll area, central Iceland. Bull Volcanol, 54: 385-392. Sturkell E, Sigmundsson F, 2000. 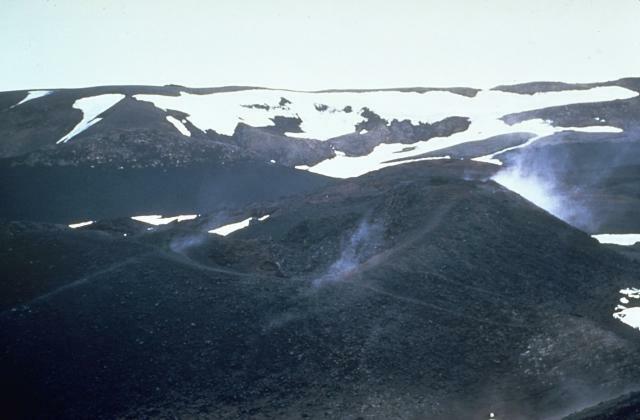 Continuous deflation of the Askja caldera, Iceland, during the 1983-1998 noneruptive period. J. Geophys. Res, 105: 25,671-25,684. Thorarinsson S, Sigvaldason G E, 1962. The eruption in Askja, 1961, a preliminary report. Amer J Sci, 260: 641-651. There is data available for 14 Holocene eruptive periods. Remarks: InSAR data from the Radarsat satellite shows that Askja continued subsiding from 2000 to 2009. 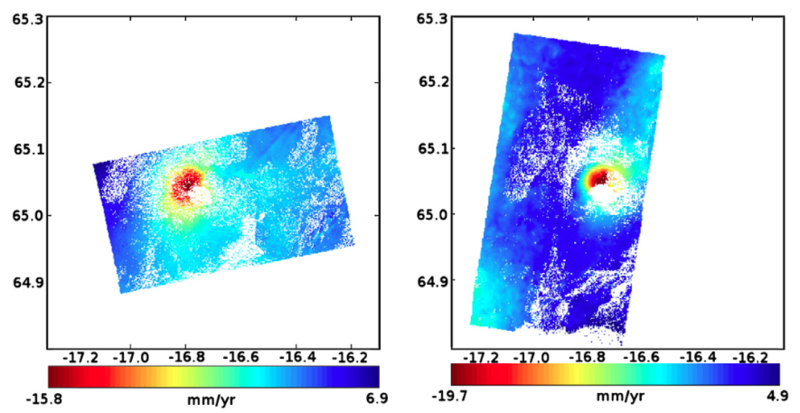 Average LOS velocity (mm/yr) over 9 years from the F1 (left) and F5 (right) frame. Incoherent white oval area is lake O?skjuvatn. From: de Zeeuew-van Dalfsen et al. 2012. Reference List: de Zeeuew-van Dalfsen et al. 2012. Remarks: InSAR data from the ERS satellite shows an average subsidence rate of 5 cm/year during 1992-2000. Interferograms covering the Askja volcano. Their time span is given in the upper right corner. Overlaid are Askja volcanic settings as in Fig. 1. Panels from a to d are interferograms from track 238, panels from e to h are from track 009 and i and l are from track 281 (see Table 1). In panels a and m, we show horizontal GPS displacements. From: Pagli et al. 2006. Reference List: Pagli et al. 2006. Pagli, C., Sigmundsson, F., Árnadóttir, T., Einarsson, P., Sturkell, E.,, 2006. 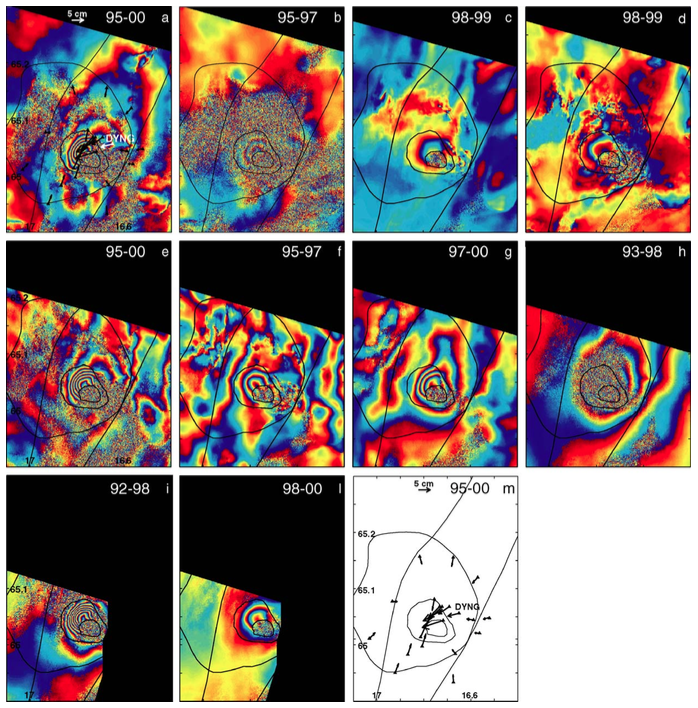 Deflation of the Askja volcanic system: contraints on the deformation source from combined inversion of satellite radar interferograms and GPS measurements. J. Volcanol. Geotherm. Res., 152, 97-108. Remarks: Subsidence of 75 centimeters occurred between 1983 and 1998 during a non-eruptive period. Reference List: Sturkell and Sigmundsson 2000. Sturkell, E. and F. Sigmundsson,, 2000. Continuous deflation of the Askja caldera Iceland, during the 1983-1998 non-eruptive period. J. Geophys. Res., 25671-25684. There is no Emissions History data available for Askja. The dark lava flow in the foreground was erupted from the NE side of Askja caldera in 1961. The flat-topped mountain in the distance to the NE is Herdubreid, the most famous of Iceland's "table mountains." These steep-sided mountains were formed by repeated eruptions during the Pleistocene through the glacial icecap. The subglacial lava flows and fragmental hyaloclastite rocks ponded against the melted walls of the glacier. Only at the last stage were minor subaerial lavas erupted above the icecap, forming the small summit peak. Photo by Richie Williams, 1973 (U.S. Geological Survey). Steam rises in 1967 from a scoria cone along the Vikraborgir crater row, which was formed during an eruption of Askja volcano in 1961. The eruption began on October 26 from a fissure cutting the NE caldera floor. A chain of small scoria cones formed over the eruptive fissure, which fed lava flows that traveled 9.5 km to the east. Photo by Richie Williams, 1967 (U.S. Geological Survey). 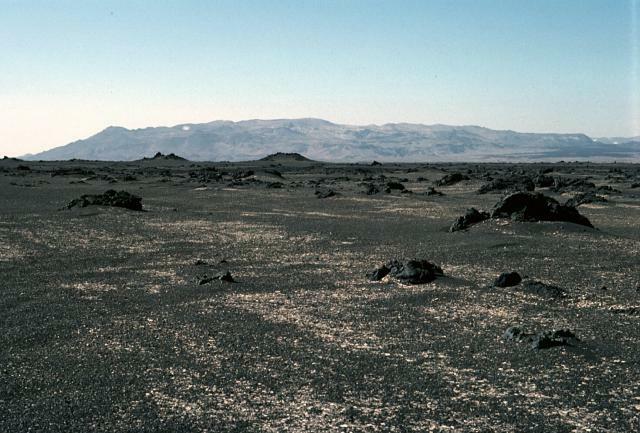 An eruption from a radial fissure on the NE floor of the Askja caldera took place in 1961, during which lava fountains reached a height of 300 m. The Vikraborgir scoria-cone row, seen here, was built over the eruptive fissure. The fissure fed a 0.1 cu km basaltic lava flow that traveled 9.5 km to the east. The eruption began between 1056 and 1430 hrs on October 26, and ended in early December. 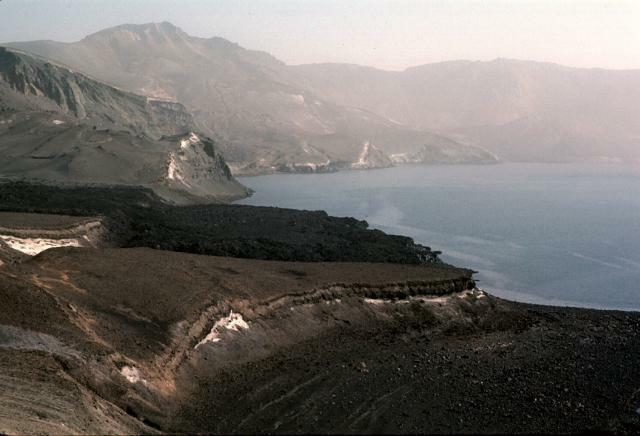 Photo by Richie Williams, 1981 (U.S. Geological Survey). Askja's largest historical eruption began on New Years day, 1875. Minor explosive eruptions, lava flow emission, and slow caldera collapse preceded a powerful March 28-29 eruption. Subsidence of the caldera continued for several years and resulted in the formation of Askja's inner caldera, now filled by Öskjuvatn lake, seen here from the west. The Askja eruption and collapse were intimately related to the 1875 Sveinagjá fissure eruption, which began on February 18, 1875, about 50-km north along the Askja fissure system. 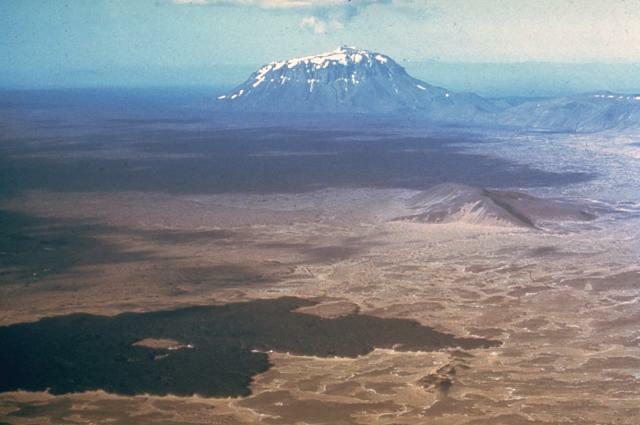 Photo by Michael Ryan, 1984 (U.S. Geological Survey). 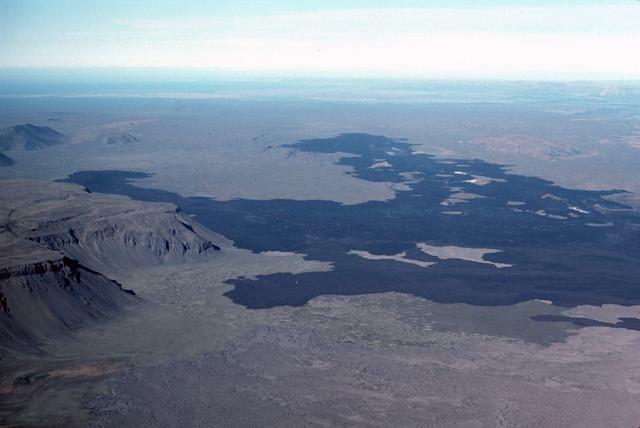 The 1921 Batshraun lava flow descends from a vent (left center) into Öskjuvatn lake across several fault blocks related to subsidence of the Öskjuvatn caldera in 1875. 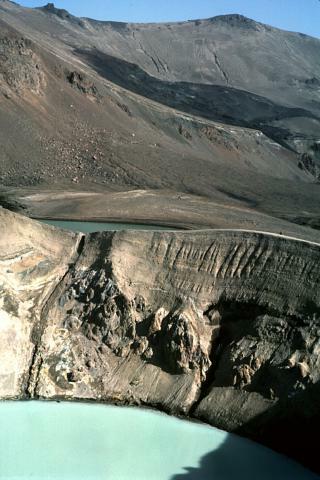 This aerial view from the west shows the small 100-m-wide Viti maar (lower center), which formed during the 1875 eruption. 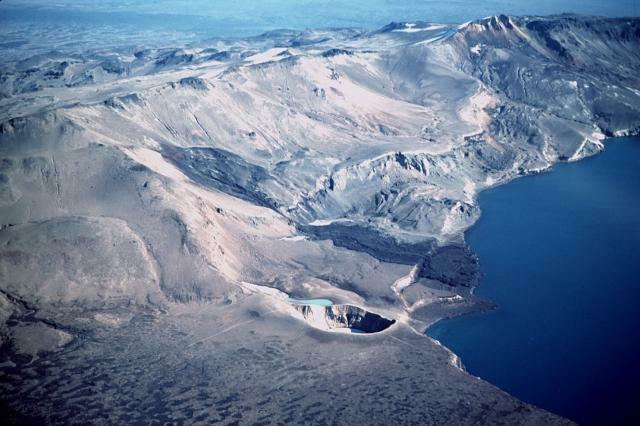 Following slow subsidence of the caldera during the 1875 eruption and several subsequent years, the depression was filled by the waters of Öskjuvatn lake. 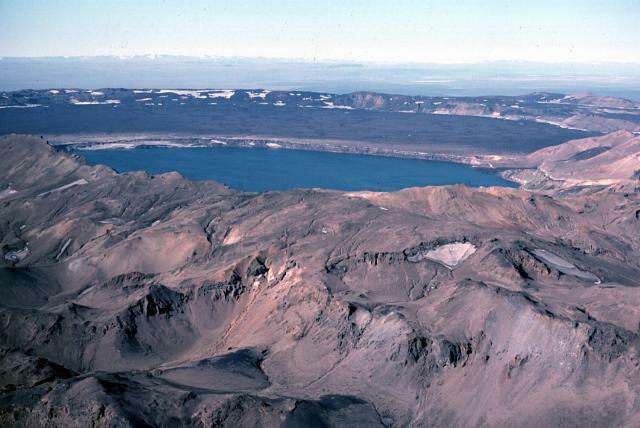 During the 1920's, several lava flows erupted from vents surrounding the caldera and flowed into the lake. An eruption from a radial fissure on the NE floor of Askja caldera took place in 1961. It produced this 0.1 cu km basaltic lava flow, seen here from the SE, which traveled 9.5 km to the east. Vigorous lava fountains feeding the eruption reached a height of 300 m. The eruption began on the afternoon of October 26, when athe ash column reachd 6 km. Lava effusion began almost immediately, and the lava flow had traveled 7.5 km from the vent at Vigraborgir by October 26. The eruption continued until early December. The lava flow at the lower right was erupted during 1961 from a vent on the NE side of Askja caldera and flowed 9.5 km to the east. 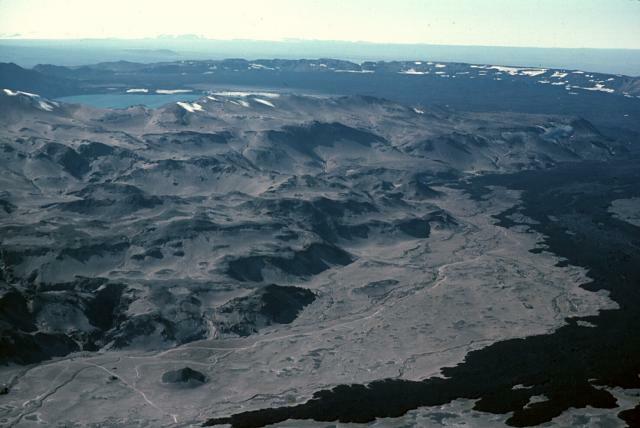 Snowfields cover part of the far wall of the caldera in the distance, beyond its flat lava-covered floor. 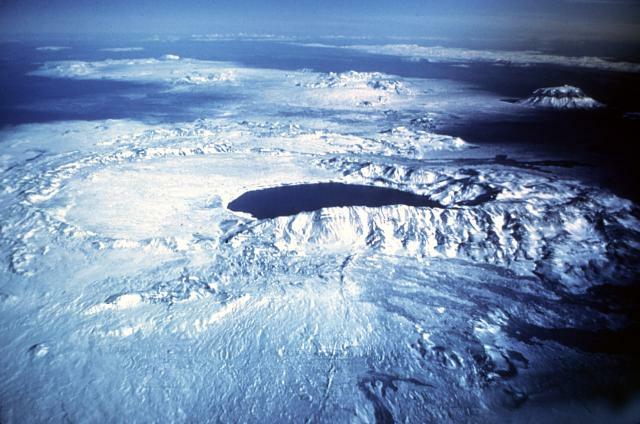 The lake at the upper left is Öskjuvatn, which fills Askja's youngest caldera, formed in 1875. The irregular slopes of the Dyngjufjöll massif in the foreground are formed almost entirely by the products of subglacial eruptions. Askja is a large central volcano that forms the Dyngjufjöll massif. It is truncated by three calderas, the largest of which is 8 km wide. This view from the SE looks across Öskjuvatn lake, which fills the youngest caldera. It formed in 1875 during Askja's largest historical eruption and truncates a larger caldera, whose wall is seen in the distance above the lava-covered caldera floor. The 100-km-long Askja fissure swarm, which includes the Sveinagjá graben, is also related to the Askja volcanic system. The massive Askja shield volcano, seen here from the north, forms the Dyngjufjöll massif. Almost all of the massif is composed of subglacial pillow lavas and hyaloclastites. The broad summit of the volcano is truncated by three overlapping calderas, the youngest of which formed during an eruption in 1875. An extensive 100-km-long fissure system extends north of Askja, well beyond the point of this photo. The Askja fissure system includes the Sveinagjá fissure, which was active during 1875. The small 100-m-wide, steep-walled Viti maar crater, filled by a turquoise lake, was formed by phreatic explosions following a major plinian eruption at Askja on March 28-29, 1875. Note the fault cutting the left-hand crater wall. The dark lava flow in the background was erupted from a vent on the NE caldera wall of Askja. The lava flow traveled west into Öskjuvatn lake, out of view to the right. 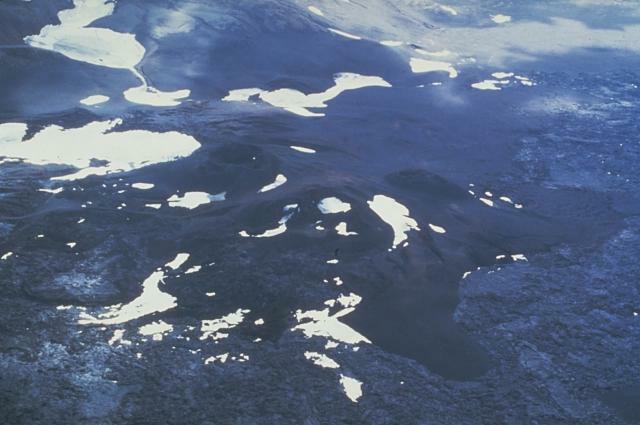 The dark Batshraun lava flow descending from the left into Öskjuvatn lake was erupted during 1921. The lava flow originated from a vent below the rim of Askja's central caldera, and flowed over the low rim of the younger 1875 caldera into the lake. The lava flow was the first of several during the 1920's that flowed into the NE, SE, and west sides of Öskjuvatn lake. Askja, seen here in an aerial view from the south, is a large central volcano that is truncated by three overlapping calderas. The youngest caldera, formed during Askja's largest historical eurption in 1875, is filled by Öskjuvatn lake (center). This caldera partially truncates the largest Askja caldera, whose floor forms the flat-surfaced area left of the lake. The 100-km-long Askja fissure swarm has also erupted during historical time. Twentieth-century eruptions at Askja have produced lava flows from vents located mostly near Öskjuvatn lake. The Global Volcanism Program has no maps available for Askja. Catalogue of Icelandic Volcanoes (Link to Askja) The Catalogue of Icelandic Volcanoes is an interactive, web-based tool, containing information on volcanic systems that belong to the active volcanic zones of Iceland. It is a collaboration of the Icelandic Meteorological Office (the state volcano observatory), the Institute of Earth Sciences at the University of Iceland, and the Civil Protection Department of the National Commissioner of the Iceland Police, with contributions from a large number of specialists in Iceland and elsewhere. This official publication is intended to serve as an accurate and up-to-date source of information about active volcanoes in Iceland and their characteristics. The Catalogue forms a part of an integrated volcanic risk assessment project in Iceland GOSVÁ (commenced in 2012), as well as being part of the effort of FUTUREVOLC (2012-2016) on establishing an Icelandic volcano supersite. Large Eruptions of Askja Information about large Quaternary eruptions (VEI >= 4) is cataloged in the Large Magnitude Explosive Volcanic Eruptions (LaMEVE) database of the Volcano Global Risk Identification and Analysis Project (VOGRIPA).